The Sweet Gum Tree is one of those few novels I can honestly admit that you need to be older to fully understand the full emotional impact of. While it starts off detailing a teenage romance, it shifts fifteen years into the future to a broken relationship and the slow journey of its healing. It is this second portion of the novel that I loved, but never quite connected as much with. I can truly say that if I had been older, perhaps in my thirties and with kids, I would have instantly fallen head-over-heels for this story. Around a decade younger than the intended audience, perhaps, I was still able to appreciate and enjoy this story, but I wasn't able to thoroughly lose myself in it and forget about its flaws, although minor. Thus, while The Sweet Gum Tree isn't one of those novels that teens shouldn't read such as Fifty Shades of Grey, since it is rather chaste, it does cover topics that younger audiences may not be able to thoroughly empathize with, thus changing the reading experience ever-so-slightly from the rumored hype surrounding this book. Allred's novel is split into two parts; the first, detailing eight-year-old Alix French's introduction and love story with Nick Anderson, the sweet and quiet son of the town drunkard, and the second, fifteen years after Nick leaves Alix in their teen years as he is accused of killing his father in self-defense. While The Sweet Gum Tree starts out rather slow, I encourage you to keep reading. Allred's novel is character-driven and while the majority of the first-half of the novel seems almost unnecessary, it isn't. It helps us, as the reader, gain a clearer understanding of Alix, our protagonist, and her relationships with both Nick and her family as she grows into a woman in the South. 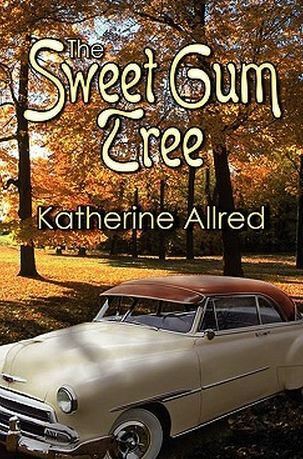 Although The Sweet Gum Tree is marketed as a romance, it's really a novel about family. Alix's relationship with each of her family members is unique and Allred's realistic and in-depth portrayal of their impact on Alix's life is remarkably written. Still, don't let that fool you. The Sweet Gum Tree is, at its very heart, a romance. Alix and Nick meet as young children and their gradual love story as they grow is heart-warming to see unfold. Thus, the events that pull them apart are tragic and devastating and the journey they have to face to find themselves back to where they first began is one that cannot be missed. I've said it before, but novels that focus on the impact and repercussions of a love story more than the love story itself usually make a way into my heart, and this novel was no different. I simply ate up the heartache, the obstacles, and the careful manner in which Nick and Alix somehow found a way back to one another, despite their one-step-forward-two-steps-back approach. What I loved the most, though, is the fact that Alix and Nick are in control of their lives. Whatever issues they face, they themselves have caused and in learning to fall in love with each other all over again, they learn to fix themselves, their flaws, and live with them. It's all so realistic and touching that I couldn't help but become dragged into their admittedly angsty love story and somehow enjoy it, despite its drama, for the realistic moments of clarity, depth, and poignancy far outweighed the flaws in this love story. What surprised me still further was how, despite a dominant love story, Allred continued to develop Alix's complex personality in the second-half of the story. We see Alix fifteen years later and it is startlingly touching to see how her relationship with her parents has changed, how certain events have shaped her, and how she's a completely different person, while still inherently retaining her nature. Just the manner in which Allred has written Alix as a dynamic character truly took me by surprise and she is easily one of the most fleshed-out characters I've come across, which definitely made this novel an emotional read as the reader was so invested in the story. Nick, as our other main character, is also remarkably life-like, as are Alix's parents, her grandfather with whom she has a beautiful relationship, and her best friend. Each one of these secondary characters play as large a role in Alix's life as Nick himself, which was refreshing and created an even more complete outlook on Alix's life. Even the flow of the story, despite being character-driven, was smooth and the growth was extremely realistic, so I certainly have to give Allred props for having such a strong hold on her characters. Nevertheless, there were certain aspects of this story which grated on me. First and foremost, the narration. I thoroughly enjoyed Alix's voice, but the story is told from the future, which means we receive short interjections from Future Alix telling us that if she had ever known what was to come, she would have acted differently, etc. While at first this wasn't too bad - Karen Marie Moning employs a similar tactic throughout the Fever Series after all - it was continuous and repetitive and each chapter seemed to end on an ominous cliffhanger because of it. Ultimately, since it was so overused, it didn't work. It didn't create that element of fear or mystery and just became annoying. Moreover, in regard to the mystery surrounding Nick's sudden departure and the true circumstances of his father's death, I didn't find it all that "mysterious." Once the half-way mark was passed, the pieces slowly began to come together and it wasn't a shocking reveal in the least. Thankfully, Alix herself finds out the truth with less than a quarter of the novel to go, so we get to see some of the repercussions and impact - all which was very well done - and overall, that small bit of predictability didn't impact my enjoyment of the novel, but it's just something to keep in mind. One of the few things that did truly impact my enjoyment of this novel, however, were some aspects of the plot. Seriously folks, everyone in this town is having an affair with everyone else in this town. So. Much. Drama. While the plot concerning the character growth and development all felt very natural, realistic, and life-like, it sometimes felt as if the dramatic instances in this novel were forced. I never knew an eight-year-old's life could be so drama-filled, but apparently in the South, or at least in this town, it certainly is. Even as Alix grows up, we have drama story after drama story. In my eyes, most of them worked out well, were dealt with efficiently, and only furthered the plot. Others, however, could have easily been left out and didn't do much to the tale. Yet, I am grateful that no matter what Allred threw at us, she made sure to craft her characters carefully so that the eventual impact of that event was felt on them, and in turn us, no matter how strange its entry into the piece. Thus, I can't really find too much fault with this book. Allred's narration may not have worked for me, but her characterization was spot-on and some of the issues she tackled in this book were remarkably dealt with. I do, however, feel as if I would have been utterly invested in this if I were older. Some of the events in Alix's life were ones I could only sympathize, not empathize, with so while I don't warn younger audiences away from this book, since there's nothing to censor or warn away from, I do think it will wind up being a much more powerful read a couple of years down the line. I certainly intend to come back to it in the future and see how my reactions change with age and experience. Ultimately, however, The Sweet Gum Tree is every bit as entertaining and romantic as I expected and when a contemporary novel surprises me with its depth, I can't possibly ask for anything more. Great review, hun! This isn't a book I've heard and probably not one I would have picked up on my own, but like you I enjoy stories that revolve around families and that feature strong characters. The drama-aspect puts me off a little but I could probably look past it! I have to say that cover really doesn't do much in the way of making me want to pick this one up, but I'm glad to know that despite the few problems you had with it, you enjoyed it overall. The ominous cliffhangers and the short interjections from future Alix would be a tiny bit frustrating when used in excess though, I can definitely see myself just wanting the story to continue without Alix butting in again and again:) Lovely review as always Keertana! Hmm, I'm not sure how well I'd get along with this book. For one, I don't believe that any relationship CAN heal, as far as I'm concerned, once it's broken, it's broken. People pretend, though. Who knows, maybe Katherine Allerd would be able to convince me otherwise. I love these books that happen over long periods of time, it makes the events more believable every time. I've read entire series that happened in a month or so and I never really enjoyed it. But seriously, a small time drama where everyone is having an affair with everyone else? Sign me up, haha. I'm predictable like that. Sometimes that's precisely why I have issues connecting with adult novels. It is easier for me to relate to teenagers than it is for me to relate to a 30-something year old with kids. I'm not sure how I would feel about some parts of this, but it does most definitely sound like a book worth trying out. Brilliant review, Keertana! I completely know what you mean by those books that sometimes you're just too young to read. When looking at romance, I usually avoid reading about anyone 10 or more years older than me because i know I just won't relate to them the same. This one definitely sounds as if it's more about a family than a romance, particularly because it takes place over such a long period of time. I kind of love that the romance unfolds over all of that time though! This is one of those I'd never have heard of if you hadn't reviewed it. Wonderfully written, Keertana! Because of the vehicle on the cover, I actually would have thought this was historical instead of contemporary--I suppose that's just because it's over such a period of time. Heidi, I agree - that cover is SO misleading! Ironically, it does sit with the novel, but they could have chosen a much better picture for sure, not to mention title font. I am probably the only one that can appreciate sweet gum trees since I live in the south and all! Like camellia and azalea bushes they remind me of the OLD south, the kind my grandmother grew up in. Old houses with sweet gum and pecan trees standing sentinel in the yard. This book sounds lovely but also a bit of a chore to read. Books that span large lengths of time, and then constantly go back and forth in time are fine, but I can only handle them in small doses. And all the dramarama would probably grate on my nerves too. I like the title of this and I'm glad you enjoyed it overall. It's always interesting when a book incorporates what happens next in the future. Great review! I love books in the south, particularly when a town is involveed (or just lots of characters I guess) . I'm not sure if the drama would be too much, I might just find it entertaining. I'm curious about the characters and love that family is so much of it. If I'm looking for a book in the south I may read this. I'm in my 30's so maybe I will have more connection to it too. Did you know that you can shorten your urls with AdFly and get cash for every click on your shortened links.